It's kind of wierd that there recipes to eat my pets. I've heard that guinea pig is good, but I think there so cute so I'd probably never be able to eat one. Ewww!who would eat an innocent furry creature? Nice list--I have a friend who love a good home-cooked gopher, so this made me think of him and smile. I ACTUALLY SCREAMED WHEN I READ THAT. have we run out of food or something? "Nutria" sounds like some sort of health food, like Truvia or something. Honestly, I think it's not that big a deal. We freak out about hamsters, but if you went to India a lot of people would freak out about beef. Gross is relative. OMSC, that is so wrong. I actually have a hamster, and I was enraged ... They're not serious, right?! Awwwww, there so cute! tough, I wonder why anyone would want to eat Barbeque hamster steaks. Or gerbil stir-fry. Or baked racoon with southern dressing. Hazel has a REALLY good point you guys. I totally agree with her. It's not like eating a sweet little calf is any worse than that. After reading for a long time and not posting anything...I have to say something. All this food is ... surprising. Alright, and I'm off to go put some garnishes in my sister's hamster cage. And also Marie: I don't know. how can you eat an innocent little pig/cow/chicken? that is the cutest thing i have seen sence princehumpedinck.he was so cute!did you know that hamsters like tolit paper rolls,and they like tolit paper rolls.it is craze.i love hamsters.there one of my faverit animals.CUTE CUTE CUTE hamster. i think Hazel is right so we shouldn't freak out about this so much. 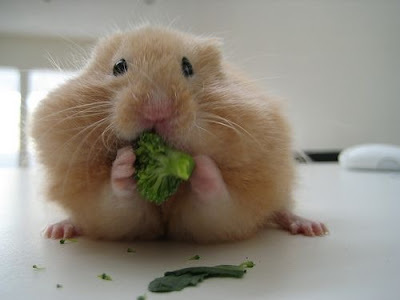 think about it...if hamsters were the last source of food on the planet what would you do: (no vegetables or anything) starve, eat a hamster or eat a person. i think i would pick the hamster. besides i'm sure native people ate stuff like that all the time and didn't even think twice about it. Reel Dancer, exactly what i was going to say. i remember in my social studies class we read about how some pioneers were trapped on the mountains for the winter, and when they ran out of food, so they ate the dead people. i mean ACTUAL DEAD HUMANS. so i am not a veghead, or a vegan, but i would never eat a hamster. hey kristen, my school's getting out this tuesday. do you think you could post a good- bye school, hello summer post for everyone. i would totally love to see a picture to go with it!!! will you be having a contest soon, i have this really cool thing, but i missed the other one! I'd say Hazel has a good point, yeah--but it is a culture thing, I think. People in other cultures eat crickets, dogs, in Germany you can get horse sausages (I've done it). But we (or a lot of us--I don't know where y'all live :]) have been brought up in a culture where that isn't normal. On a rodent related note, my hamster took the grand championship in my local hamster races the other day. Baxter's a winner, yay!!! my state has an "a" in it. that's pretty cool! I have a hamster. I'm not going to eat it. When I said I was going to eat a hamster and my friend thought i was sick and calld me names I was kidding I diden't know you CAN eat them I would NEVER EAT SOME THING LIKE THAT! My best friend had guinea pig in Ecuador once. (She didn't know what it was until later.) She said it tastes like chicken. Yum! Also, I've had rabbit and it's not so bad. We have this wild game dinner night in our town, and it's all roadkill, basically. The special is "bear balls". (Poor name choice... it's spaghetti and meatballs from a bear...) And there's a whole vat of something called "wild", which is roadkill that was so badly mangled or something that it's unidentifiable. Trust me, 3 bean prairie dog isn't as gross as a lot of other foods. Yeah dangerous UR right all you guys are like "I couldn't eat a cute lil furry hamster"
a whole lota other LIVEING CREATURES!!!!!!!!!!!!!! and when your big and fat people kill you and your made into chicken nuggets.